In a reply to allegations pertaining to poll rigging being leveled against MQM in Karachi and Hyderabad, Muttahida Qaumi Movement (MQM) Chief Altaf Hussain said if the ‘establishment’ doesn’t like the mandate of his party, it should go ahead and detach it from the rest of the country. The MQM Chief dared anyone who is opposing his party to come up with evidence and warned that if opposition was not stopped, he would not take long to let his associates free to act on their own. “How can I control them and for how long,” he added. People in Pakistan, Karachi are fighting for their rights by facing directly threats, they have stood up against the terrorist MQM Mafia. Altaf Hussain gave direct threats on TV channels that MQM will kill the peaceful protesters if they do not leave the protest. He also talked about separating Karachi from Pakistan. Dear People in UK – now it is your responsibility to start a legal process against this criminal Altaf Hussain. Call your local police office and file a report against him for openly threatening Pakistani citizens. Write letters, emails and make phone calls to your local MPs in UK to register your protest and expose the criminal Altaf Hussain. MQM has done massive rigging in Karachi elections by using their terror tactics but the people of Karachi have rejected MQM and Altaf Hussain. Their time is ending soon the people of Karachi will decide their future and not some terrorist living in UK. Carol Anne Grayson is an independent writer/researcher on global health/human rights and is Executive Producer of the Oscar nominated, Incident in New Baghdad. She was awarded the ESRC, Michael Young Prize for Research 2009, and the COTT ‘Action = Life’ Human Rights Award’ for “upholding truth and justice”. 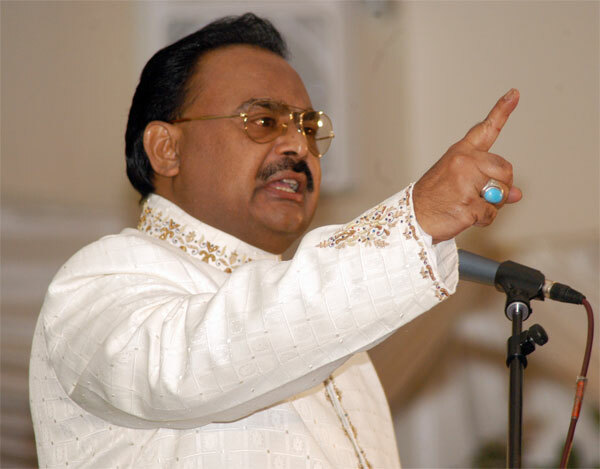 Altaf Hussain is a British Citizen who causes unrest in Pakistan through his inflammatory speeches.